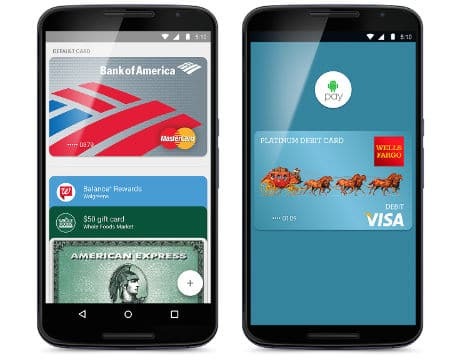 Google has begun rolling out its Android Pay mobile payment platform across the US today. In-store NFC mobile payments using the system will be possible at more than one million locations within the next few days, with in-app payments and loyalty expected later this year. The news comes as Google relaunched and repositioned its tap-and-pay Google Wallet app as a peer-to-peer payment solution this week. “We’ll be rolling out gradually over the next few days and this is just the beginning,” the company says. “We will continue to add even more features, banks and store locations in the coming months, making it even easier to pay with your Android phone. “Android Pay works with all NFC-enabled Android devices (running KitKat 4.4+) on any mobile carrier, at every tap-and-pay ready location across the US. Android Pay will support credit and debit cards from the four major payment networks — American Express, Discover, MasterCard and Visa. “These cards are issued by many of the most popular US banks and credit unions, including American Express, Bank of America, Discover, Navy Federal Credit Union, PNC, Regions Bank, USAA and US Bank. Citi and Wells Fargo will be available in the next few days, Capital One is coming soon and we’re adding new banks all the time. “You can use Android Pay at over one million locations (and counting) across the US, everywhere tap and pay payments are accepted.” The list includes Macy’s, Bloomingdales, Office Depot, Staples, Subway, Toys R Us, Whole Foods, Jamba Juice, American Eagle Outfitters, Panera Bread and others. “Later this year, you’ll also be able to use Android Pay to speed through mobile checkout in your favourite apps,” Google adds. Android Pay was unveiled during the Google I/O keynote in May. It is an open platform that adds tokenization and fingerprint verification to Google’s existing support for host card emulation (HCE) and NFC payments and will be made available globally. “Today we’re starting to roll out Android Pay, bringing our next generation mobile payments platform to Android users across the US,” says Pali Bhat, Google’s director of product management for Android Pay. “Mobile payments is an important area for Google and this is just the beginning for Android Pay.